Recent years has seen a surge of interest in a new type of vinyl flooring known as luxury vinyl, sometimes abbreviated as LVF. Nearly all vinyl flooring brands now offer product lines under the LVF label, along with their standard vinyl sheet and tile flooring lines. Luxury vinyl flooring differs from the older-style standard vinyl sheets or tiles in its ability to realistically mimic the look of natural materials—principally wood or stone. There are also luxury vinyl products that are realistic copies of ceramic and porcelain flooring. Luxury vinyl features a surface layer that is an extremely realistic photo-created layer, along with textures that are quite similar to that of the natural materials they attempt to mimic. The products aimed at resembling stone may use a mixture of vinyl resins and limestone particles in the composition. Luxury vinyl typically comes in tiles (LVT) or planks that use a modified form of tongue-and-groove technology to join the pieces. Some products use traditional glue-down methods for installation Luxury vinyl is more expensive than standard vinyl, but considerably less expensive than natural stone or wood flooring products. Moreover, luxury vinyl has excellent resistance to moisture, making it practical in places where natural wood flooring simply does not work. Sorting out the brand names and manufacturers of luxury vinyl flooring is sometimes confusing. As is true of many building products, the flooring industry trend is toward consolidation of brands under a smaller group of very large manufacturing companies. Ownership of flooring brands and even manufacturing corporations is constantly changing Thus, a flooring brand that was produced by a small independent manufacturer just a year ago may today be just one brand under a large corporation that manufacturers several brands. Sometimes there are meaningful manufacturing differences between brands within such a large corporation; other times, the brand name distinction is merely a marketing distinction between products that are virtually identical except for surface design or styling. Here are some of the current major manufacturers in the world of luxury vinyl flooring. Mannington is unique in offering a sheet vinyl product that can be described as luxury vinyl; for all other manufacturers, the luxury vinyl products are either tile or plank products. The Adura brand encompasses both tile and plank offerings. There are currently nearly 200 plank styles available in a variety of widths and thicknesses, up to 72 inches in length. Most of the tiles mimic natural stone; the tiles are typically 18 x 18 inches square, or 12 x 24 inches in size. Some products are meant for glue-down applications while others use a form of click-lock connection. Armstrong is one of the oldest names in residential flooring, with a 150-year history. Based in Lancaster, Pennsylvania, Armstrong offers a huge selection of luxury vinyl floorings for residential use, with 115 different types of planks and tiles under two named brands: LUXE and Vivero. Most of Armstrong's luxury vinyls are plank products that mimic wood grains; only two stone-look tiles are available, in 12 x 24-inch tiles. The Forbo Flooring Systems corporation, makers of the familiar Marmoleum brand of residental vinyls and lineloum products, offers luxury vinyl flooring for residential use under the Allura LVT brand. The luxury vinyl offerings are relatively modest: Allura LVT makes about 40 wood-look plank products in lengths ranging from 40 to 60 inches and four stone-look tile products that are roughly 19 inches square. Shaw offers its stone-look luxury vinyl under the label LVT, and its wood-look luxury vinyl under the label LVP. Originally a small carpet company, Shaw went public as a major flooring manufacturer in 1978 and was purchased by Berkshire Hathaway in 2001. Shaw currently offers 78 wood-look luxury vinyl plank products and 5 stone-look tiles, although there are color variations within each style. Most plank styles are 48 inches long, while the stone-look tiles are typically 16 inches square. Known principally as a manufacturer of rubber flooring, Burke Flooring company also offers an impressive line of LVT flooring products, including 19 stone- and concrete-look tiles, and 13 natural wood and 8 hand-scraped wood planks. Tile products are typically 18 x 18 inches or 12 x 24 inches in size, while planks are typically about 38 inches long. In 2008, Burke was acquired by Mannington Mills, who also manufactures other brands of luxury vinyl flooring. Cryntel Enterprises, a 50-year-old manufacturer based in Hollywood, Florida, makes 74 wood-look luxury vinyl plank products and nearly 120 stone-look tiles. The emphasis on stone-look tiles makes Cryntel somewhat unusual among LVF manufacturers, and this is due to a unique manufacturing technology called Polystone, in which a large volume of natural stone material is mixed with vinyl to produce a tile that is convincingly similar to stone or ceramic. The luxury vinyl tiles from Cryntel are even meant to be grouted in the same fashion as genuine stone or ceramic tile. Karndean is a relative newcomer in the world of luxury vinyl flooring, originating as a small family business in 1973. Originating in the UK, the business moved to the Pittsburgh suburb of Export in 2005. Although a relatively small manufacturer, Karndean specializes in nothing but luxury vinyl flooring and is highly regarded in the industry. Karndean currently offers 167 "wood-inspired" plank styles and 71 "stone-inspired" tiles, making its selection one of the most diverse of all companies, despite its relatively small size. Even more unique is its selection of flooring products that mimic other materials, such as metals, fabrics, cork, and bamboo. Metroflor also touts itself as a luxury vinyl flooring specialist. Originating as a building materials distribution company in New York in 1926, Metrofloor is known for its willingness to explore new luxury vinyl technologies, such as the Grip-Strip installation engineering that allows for speedy installation without either interlocking seams or adhesives. 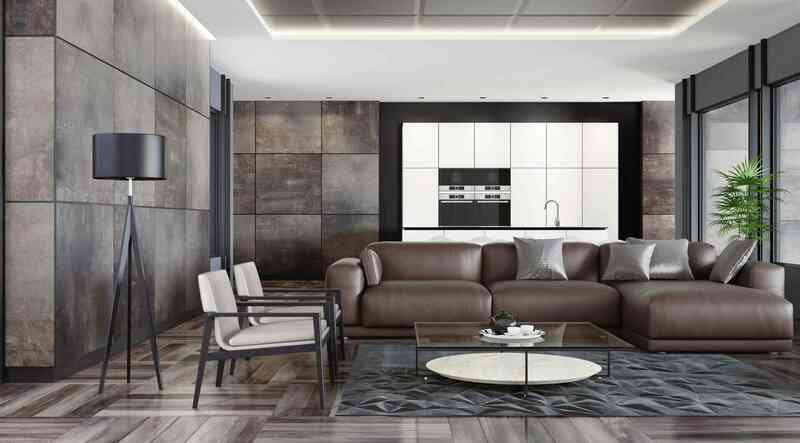 Somewhat unique among luxury vinyl manufacturers, Metrofloor offers most of its product lines in both plank and tile versions, no matter if they are wood-look or stone-look products. Mohawk is a major flooring manufacturer, though it is better known for carpeting than other types of flooring. Mohawk owns many large flooring brands, including Pergo, American Olean, and Karastan, but this 140-year-old company is a relatively small player in the arena of luxury vinyl flooring. Mohawk's luxury vinyl flooring is sold under the SolidTech brand, which includes 89 wood-look and 12 stone-look products. Some are glue-down products, while others use the Uniclick method—a modified tongue-and-groove system. Based in Dalton, Georgia, USFloors was founded in 2001 as an importer/marketer of environmentally responsible flooring products but added a U.S. manufacturing plant in 2008 and a China plant in 2013, where they manufacture cork, bamboo, FSC-certified hardwood, and luxury vinyl flooring products. The luxury vinyl flooring made by the USFloors company is more commonly known under its single brand, COREtec. Several dozen wood-look luxury vinyl planks are available, as well a good selection of luxury vinyl tiles mimicking natural stone, ceramics, concrete, cork, and bamboo. Buyers can be reassured they are choosing flooring from a company with a notable reputation for producing environmentally friendly products. Which Is Best To Self-Install: Sheet or Tile Vinyl Floor?